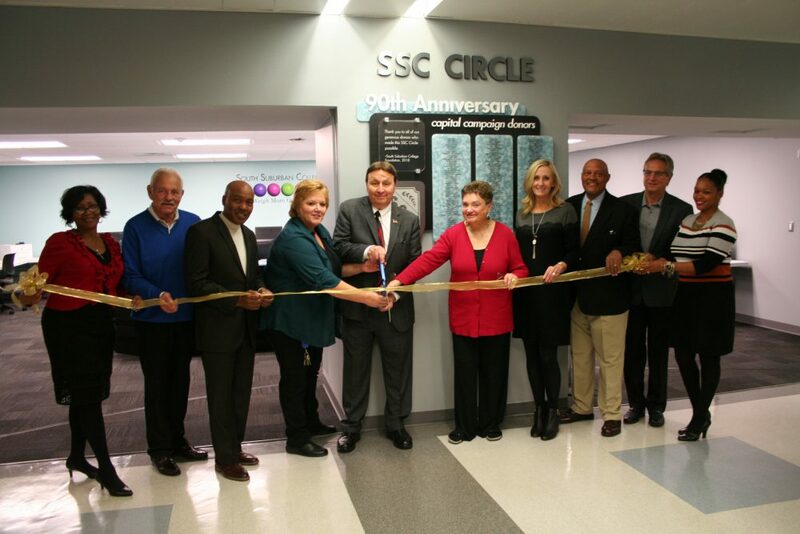 SOUTH HOLLAND, IL–South Suburban College hosted a ribbon-cutting and dedication ceremony for a new state-of the-art facility called SSC Circle on November 8, 2018. SSC Circle is a student assistance center that will serve as a “one-stop-shop” for students with questions about the registration, financial aid and payment processes, and will be a new “front door” for first-time students, said Robin Rihacek, Executive Director of Enrollment & Retention Services. The SSC Foundation launched the 90 for 90 Capital Campaign in 2017 in hopes of finally making SSC Circle a reality on campus. The campaign sought donations from college employees, alumni, board members and community partners throughout the college’s 90th Anniversary year with a goal to raise $90,000, which the college matched. All donors are recognized on a donor display in front of SSC Circle, located on the 2nd floor of the Main Campus in South Holland. In addition to capital projects, the SSC Foundation provides students of all ages, backgrounds and academic pursuits with critical scholarship assistance. The Foundation once again awarded over $100,000 in scholarship funds for Academic Year 2019 and has now surpassed $2 million in total scholarships since 1989. The Foundation is currently seeking tax deductible donations for its annual Scholarship Donor Drive through the end of the year. Contact the SSC Foundation Office at (708) 225-5846, email foundation@ssc.edu or visit www.ssc.edu/foundation to learn more or to donate. 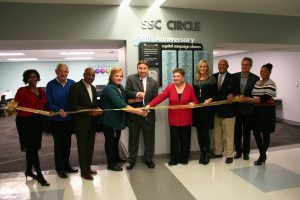 Pictured with Scissors: South Suburban College’s Robin Rihacek, Executive Director of Enrollment & Retention Services and Frank Zuccarelli, Chairman of the Board of Trustees, cut the ribbon to officially open SSC Circle, a new student assistance facility at the college’s Main Campus in South Holland.